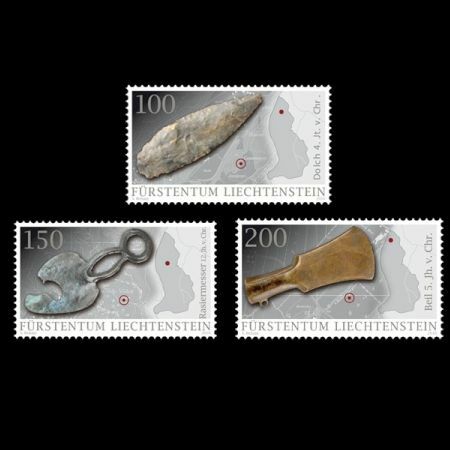 Liechtenstein 2016 "Archaeological finds in Liechtenstein: Utensils"
On March 9, Post of Liechtenstein issued a set of 3 stamps shows some archeology treasure of the country. 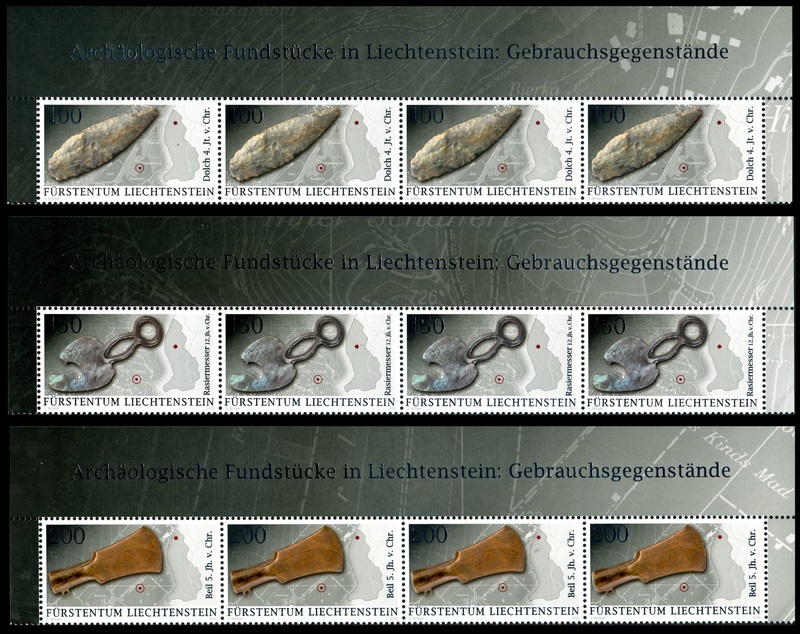 The multi-part stamp series of archaeological finds in Liechtenstein shows three utensils in this issue. The dagger was made of flint, prehistoric man’s steel, in the Neolithic period (4th century B.C.). Experts assume that it was imported from Monti Lessini at Lake Garda by people belonging to the Horgen culture who lived on the Schellenberg-Borscht site. The lancet-shaped blade which has a broken-off tip is eleven centimetres long and the organic handle is missing. 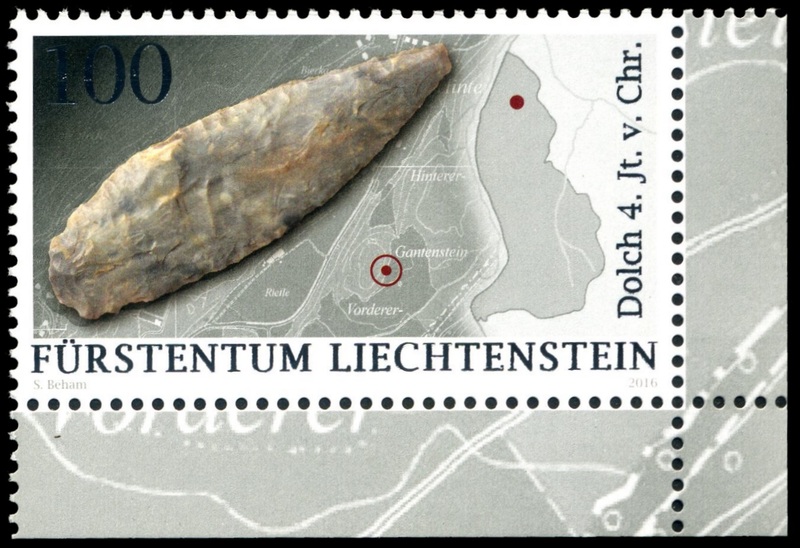 The dagger is important evidence of the trade relations that were conducted over long distances by the Neolithic inhabitants of the Alpine Rhine Valley. The razor (left) dates back to the late Bronze Age (12th century B.C.) 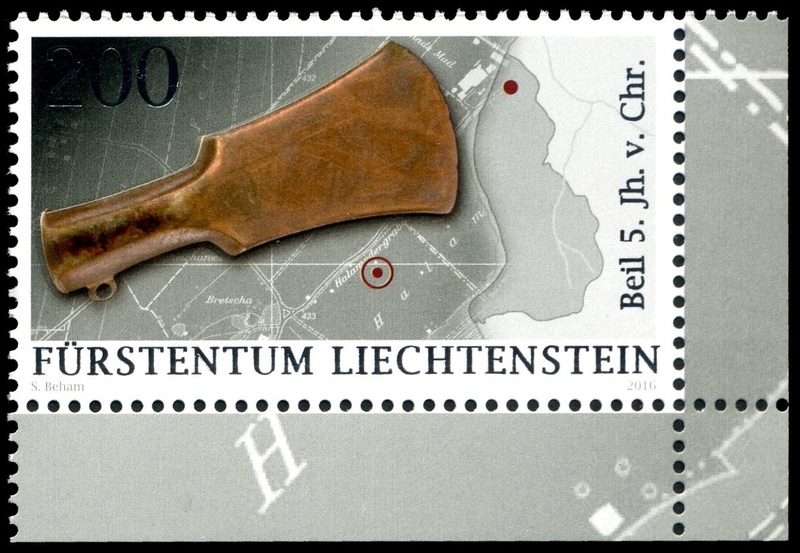 and was discovered as an individual find in a piece of woodlands in the municipality of Vaduz. Its large blade and oval, frame handle with an end ring are characteristic features of such utensils. The winged axe (right) from the Hallstatt period (5th century B.C.) 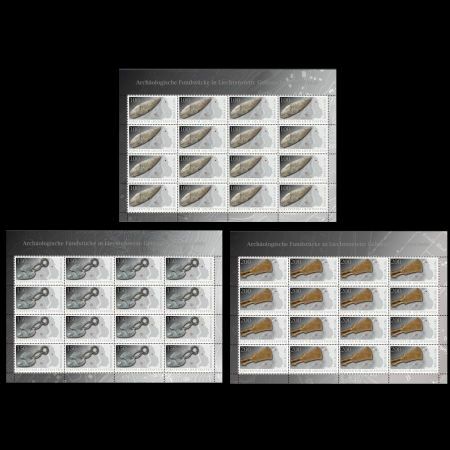 is made of bronze. It was discovered in around 1920 whilst cutting peat in the Ruggeller Riet. The two wings and the eyelet serve to fix the blade to the wooden handle that no longer exists. 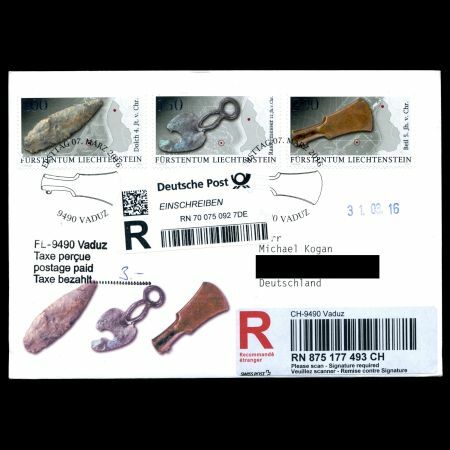 The multi-part stamp series of archaeological finds in Liechtenstein shows three utensils in this issue. 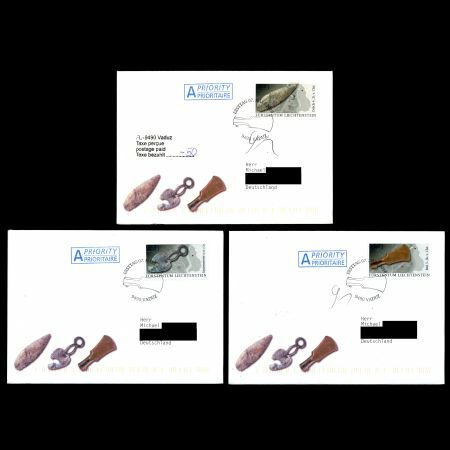 The dagger (face value: CHF 1.00) was made of flint, prehistoric man’s steel, in the Neolithic period (4th century B.C.). 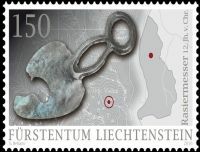 Experts assume that it was imported from Monti Lessini at Lake Garda by people belonging to the Horgen culture who lived on the Schellenberg-Borscht site. The lancet-shaped blade which has a broken-off tip is eleven centimetres long and the organic handle is missing. 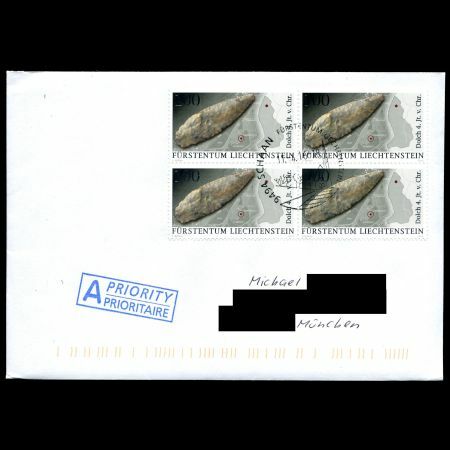 The dagger is important evidence of the trade relations that were conducted over long distances by the Neolithic inhabitants of the Alpine Rhine Valley. 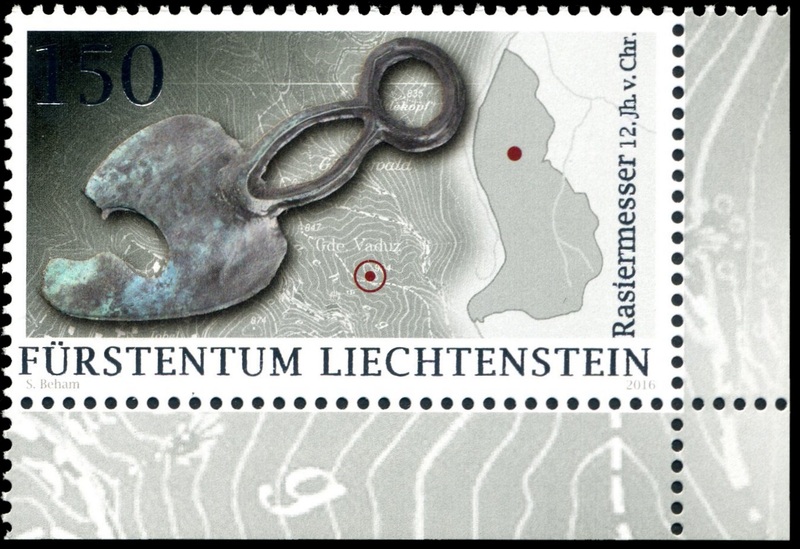 The razor (face value: CHF 1.50) dates back to the late Bronze Age (12th century B.C.) 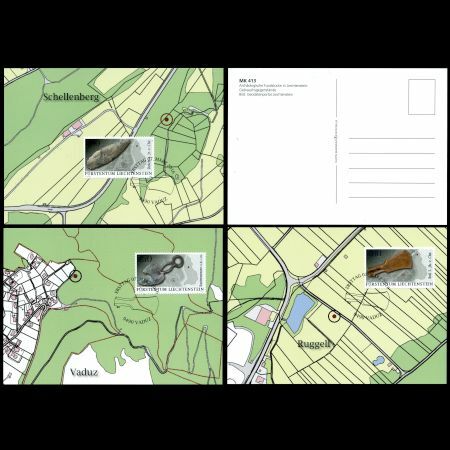 and was discovered as an individual find in a piece of woodlands in the municipality of Vaduz. Its large blade and oval, frame handle with an end ring are characteristic features of such utensils. The winged axe (face value: CHF 2.00) from the Hallstatt period (5th century B.C.) is made of bronze. It was discovered in around 1920 whilst cutting peat in the Ruggeller Riet. The two wings and the eyelet serve to fix the blade to the wooden handle that no longer exists.